When I first began photographing birds (which is the only reason I became interested in photography) I was more concerned with getting shots of unusual species, regardless of the overall photo composition, than I was with simply taking a quality photo. I've met many bird photographers that have experienced this same phenomena. It makes sense, when starting out most individuals yearn for capturing an image of something rare and exciting. After all, a rare and exciting subject makes for a rare and exciting photo, right? Don't overlook the common birds. Over time I've found I enjoy a well composed photo that invokes emotion within the viewer more so than a non-exceptional photo of a more interesting species. I've witnessed photographers (I also still fall victim) pass by grackles perched on flower covered branches dripping with warm, saturated, morning sunlight, in order to photograph red-legged honeycreepers deep in shadow on a distant branch where a quality photo is very unlikely. In those situations, take the grackles. Learn to appreciate photos that have good composition (lighting, setting, clarity, contrast, color, etc...) even if they have a "not-so-exciting" subject. Once you train your brain to favor these scenarios you'll find that you capture a great deal more quality photos. It will also prepare you for the moments when you get lucky enough to spot a quality species in a quality setting. It's important to have your skills honed in on taking advantage of accurate camera settings, quickly, when the big moments come. I was thinking through this concept while out taking photographs today. Nothing too special was going on so I decided I would put my attention on a species that I normally don't attempt to capture images of because they are very common, and don't have a particularly exciting coloration (to my eye, anyway). 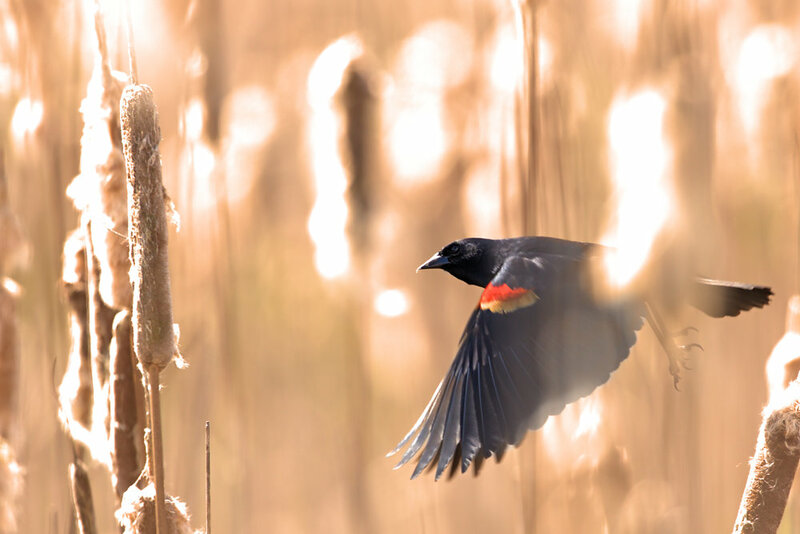 The species: the red-winged blackbird. I ended up coming away with a few photos that I really like and think are fine photos even though I'm not too personally excited about the subject. Capturing photos of common species with quality total composition will undoubtedly prepare me for the moments when a great subject happens to be in a great spot. With any luck, I'll also get some great shots along the way.